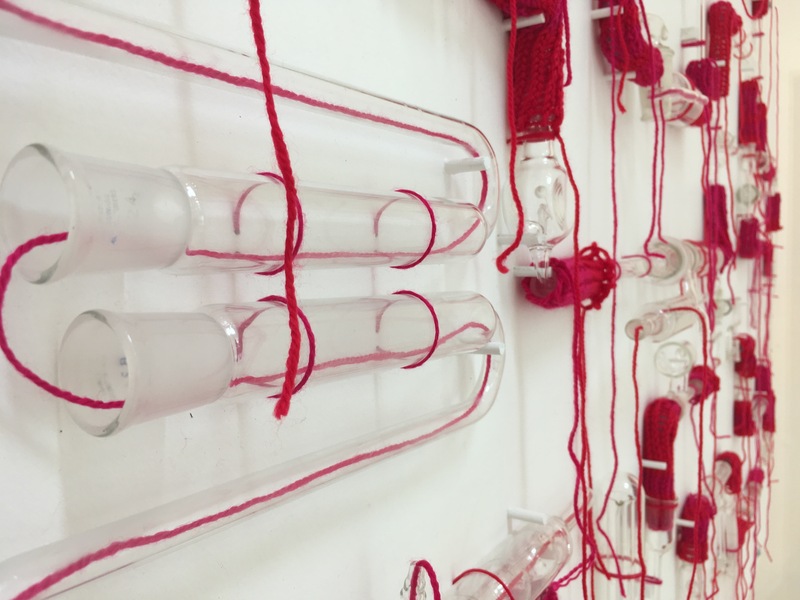 Tracey Clement, ‘Soft Science Diagram’ (detail), 2018, vintage laboratory glass, knitted and wound acrylic yarn, MDF, pine. Tracey Clement is known for creating artworks that meticulously utilise labour intensive techniques for their conceptual resonance. In Soft Science she turns her attention to knitting, a skill still largely regarded as women’s work. In Soft Science, when the domestic feminine act of knitting is made an integral part of a laboratory experiment, we are asked to acknowledge two truths: that women have always made a significant contribution to the supposedly masculine domain of science, and that the hard facts of science are not the only way to make sense of the world. Soft Science highlights the fact that there is more than one way to skin Schrödinger’s cat. In a secular society we tend to look to the quantifiable facts of science for meaning. But art too is a way of understanding the world; a knowledge generating system which is different, but no less valid. In Soft Science, when cold rational laboratory glass meets soft warm knitting, fuzzy logic is made manifest. In other words, there is no right answer in an experiment calculated to prove, if it proves anything at all, that truth is a mutable concept and that much of the universe may be ultimately unknowable.